If going from zero to 60km/hour in 2.5 seconds sounds like fun, head to Dubai to fly Superman-style above the skyscrapers. 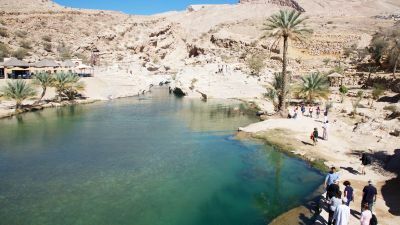 Oman was the heart of our three-part Travel Club Tour of the Middle East, in partnership with Collette. From the cultural heart at Nizwa to Muscat with its bustling souks and the starkly beautiful Hajar Mountains, Oman continues to fascinate all who visit. Pedicure takes on a whole new meaning at the United Arab Emirates' biggest falcon hospital. Peaks like softly whipped cream, tinged red by oxidised iron, the sand dunes of the Empty Quarter frame the silhouette of the misbehaving peregrine falcon. This is a resort like none you've ever imagined. Nestled among the otherworldly dunes of yellow, pink and red of the Empty Quarter, Qasr Al Sarab Desert Resort is a lavish stay where you can see the United Arab Emirates' falcons fly, watch the sun set over never-ending sand and wake up to a fog misting over the desert. The scale, the artistry and the serenity: the dream-like architecture of the Emirati capital is thoroughly impressive. 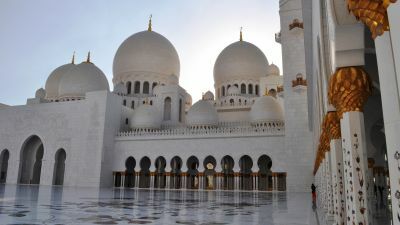 From drinking champagne at a decadent Brunch in the Clouds to feeding a patient at the falcon hospital to visiting one of the world’s largest mosques, the Emirati capital has a winning formula for stopover breaks.